Move over hangover-feeling, we’ve got a new way of naturally detoxifying! You know that feeling like you’re bloated, and/or you overdid the junk (at the summer BBQ), and you just want to feel good, refreshed and satisfied? We know it well. Here’s our solution (or at least a way to get you feeling cleaner, clearer and better). 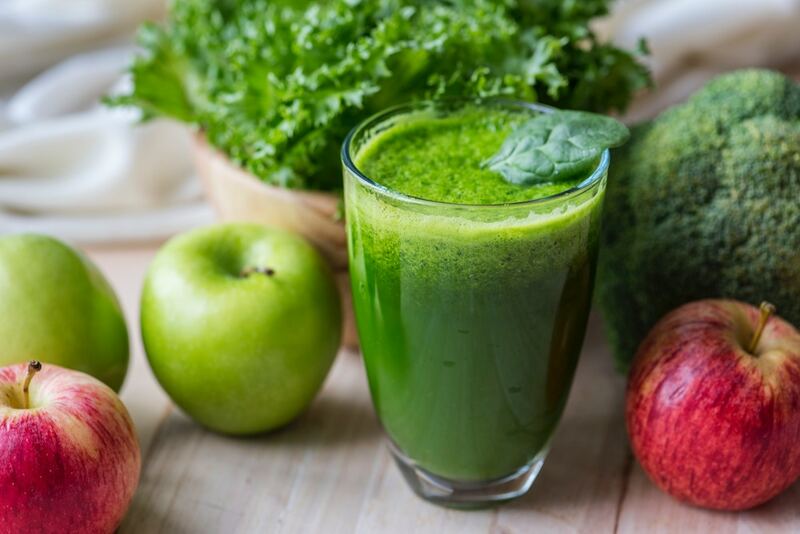 This green smoothie is tasty, beautiful and loaded with detoxifying ingredients- like all the fiber in the kale and broccoli, along with their natural ability to promote detoxification. These cruciferous veggies both contain nutrients (sulffur-containing and quercitin) that can help the liver to naturally detoxify and loads of fiber that can help to cleanse the colon. This smoothie also has a touch of banana that can help to promote healthy gut bacteria that can also help to reduce bloat and keep the system healthy. Lastly, this smoothie also contains ginger and lemon that are great for immune health and can also help to promote healthy digestion. Try this smoothie as a snack or as a meal replacement, and don’t forget to add the collagen peptides! Add ingredients to the blender and blend on high for 45-60 seconds, until well blended. Once well blended, serve and enjoy! Want more yummy smoothie recipes? Click here!